Impact mapping—introduced by Gojko Adzic—is a collaborative and visual strategic planning technique for business. This article provides a concise overview of the process, and it includes real-world examples. Four major steps follow. For simplicity, most examples are listed in the singular (such as one goal). However, multiples (such as several goals) may be used. Next, the people who can help (or be a hinderance) in achieving the goal are identified. Such people may be referred to as actors or personas. Actors are someone or something that “acts” on or with the system—such as a customer. Personas are fictitious characters that represent user types—such as Developer Dave. It is suggested that the people are as specific as possible. For the goal of “Increase revenue by 10% over the next 30 days,” examples of Who include (a) Existing Customer and (b) Prospective Customer. In this step, the impacts that need to be had on the actors/personas—for them to help achieve the goal (or minimize/avoid them being a hinderance)—are identified. 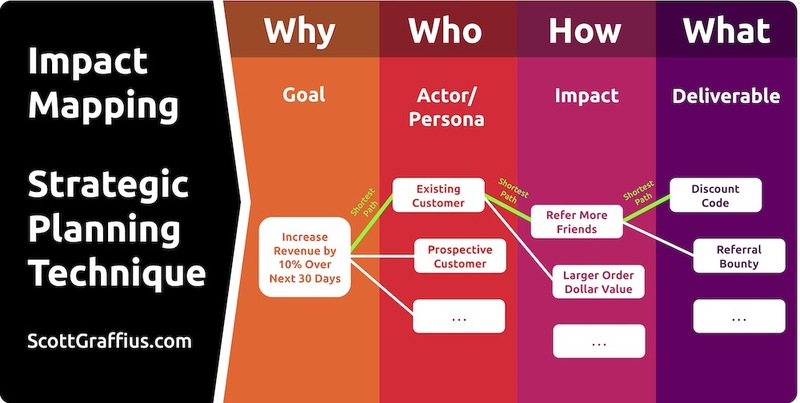 Continuing on the example from steps 1-2, an impact for the Existing Customer is to (a) refer more friends and (b) have a larger order dollar value. The deliverable which is hoped to create the impact on the actors/personas to achieve the goal is identified in this step. Said differently, What is the deliverable related to the How in the prior step. Continuing on the example from steps 1-3, deliverables for Refer More Friends include (a) discount code and (b) referral bounty. 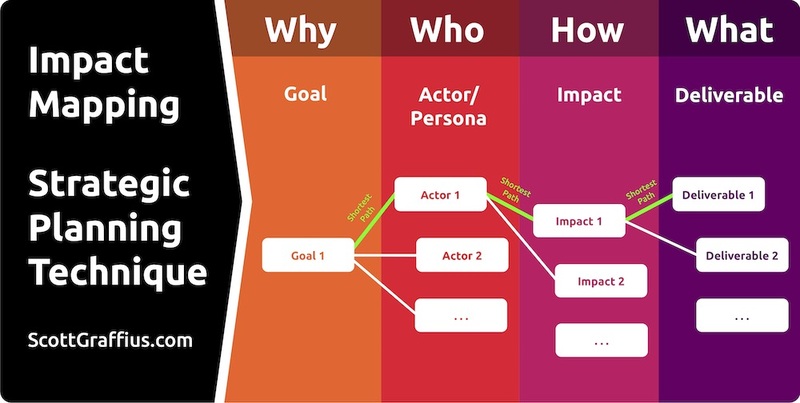 The impact map is a visual artifact, developed collaboratively while answering the four questions: “Why (Goal)?,” “Who (Actor/Persona)?,” “How (Impact)?,” and “What (Deliverable)?” The exercise may reveal considerable items for consideration. Everything does not need to be implemented, however. It is suggested that the entries are prioritized (such as determining the shortest path) and that the most important work is done. The illustration above incorporates some of the examples from this article. As shown, the shortest path involves providing a discount code related to existing customers referring more friends. In this case, that’s the work that should be done (at least done first).